KTM RC 125. 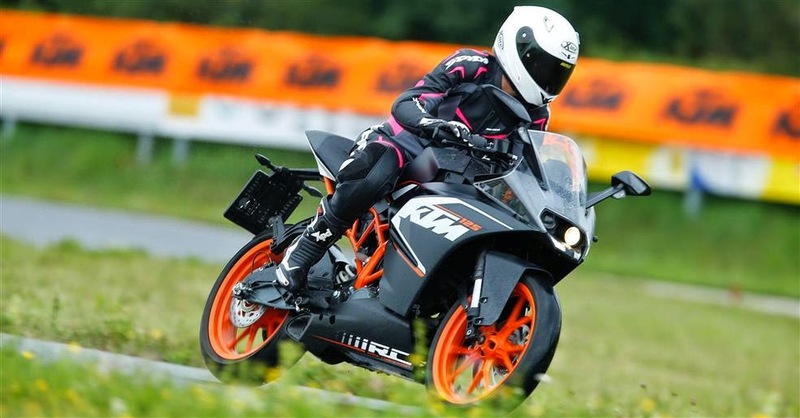 After the undeniable success of the Duke 125, Austrians drove the point by showing us for the new school year which promises to be the Sportswoman of the Year: KTM RC 125! Why? Because at € 4,595, the RC shows an exemplary finish, takes you to the office the week and why not on the track the weekend. At this price and with the standard ABS, it's unheard of! 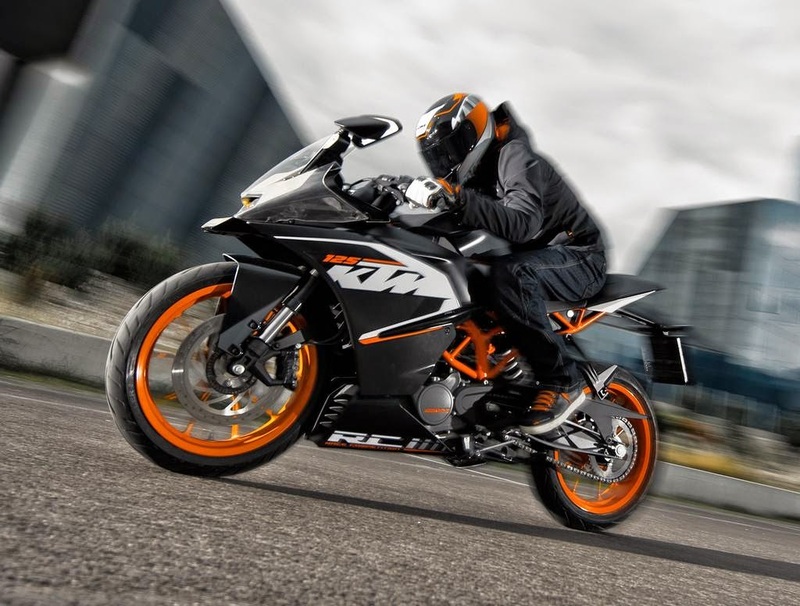 The Austrians still rejoice sales figures achieved with the Duke 125 and they are right: while the French market for sales of 125 cm3 is down in recent years (- 24.6% and in 2012 - 22.2% in 2013), the little roadster KTM reports record results over the same period! Thus, in 2012, there has been 1,447 registrations (2 nd moto overall and an increase of 10.5%) and 1,212 units in 2013. With such figures, KTM has the wind in its sails. Even if we keep in mind that the brand does not have 125 cm3 road before 2011 and that this increase is a logical step against other manufacturers on the market for several years. To mention only the look, the KTM RC 125 is strong. Moreover, even if this sports sharing common ground with the Duke 125 KTM team cautions that designers are left with a blank page to draw the bike before us today. Overall, therefore, chassis and engine are the same on the roadster and sport a few details, we will come back later. But aesthetically, the RC has a new look with a full streamlined fairing which joins the engine guard and then up the fork crown. There they faced a lens before making debate. The beak species of duck topped by two lenticular lights, which seems pretty ugly picture, passes better in reality. In addition to stunning LEDs that serve as position lights, some of that bad taste is console. Behind the rather low bubble colorless include the dashboard borrowed from the Duke. And there, hat! On his bright orange background, the pilot has a wealth of information that even sports and road "cubes" are struggling to provide us conso average, gear, tachometer and speedometer, engine temperature gauge gasoline and autonomy km, clock, service display ... In short, on a 125 cm3, the set is rewarding for the owner. And that's not all. Even stalks incorporate backlit keys. 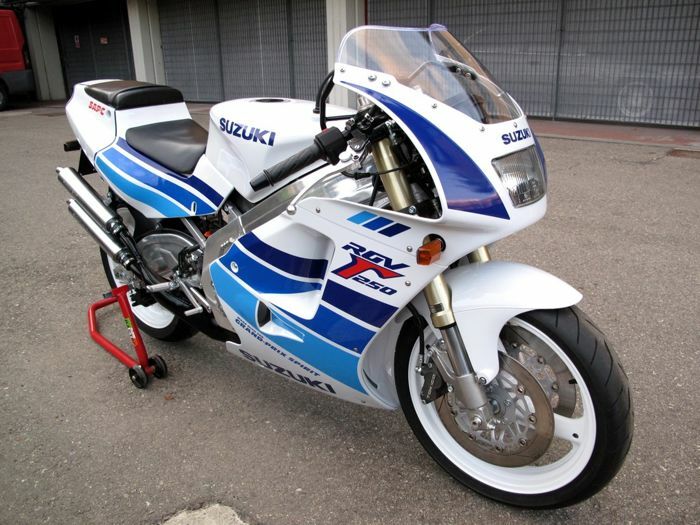 The feeling of having a "real" motorcycle is ubiquitous, especially as the size of the RC can be confusing as to its true capacity: is it a 125 or 500 cm3? It begs the question! The challenge for KTM was to make a sports both effective when takes on his favorite playground, the track, but also comfortable for the city or the secondary network. Good, comfortable is not necessarily the appropriate term for a sporty, but in any case, the gamble has paid off: the RC 125 shows at home on road and track! 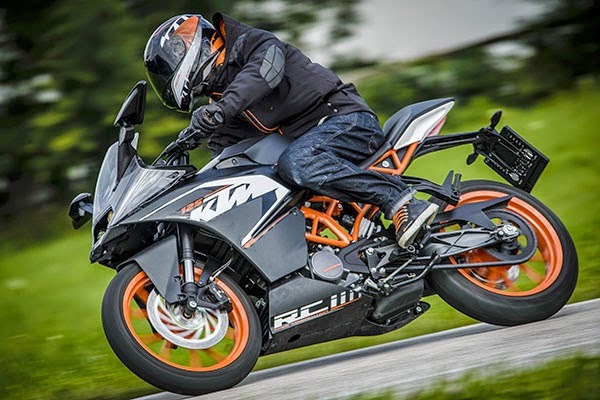 Nearly as drastic as the new Yamaha R125 (formerly YZF-R 125), or the Aprilia RS4 125, the KTM is more conciliatory in terms of comfort. Again, KTM has made it big. Put a standard ABS on a sports 125 remaining within the same prices as its competitors (Yamaha R125 to € 4,599 and Aprilia RS4 in € 4199), it had to be done! And we fully glad when we leave the city because that is where the pace is accelerating. Well, again, everything is relative, with 15 hp at 9500 rev / min, will not speak on kick a ** and if not really demonstrative, the block of the RC 125 is shows still energetic to start. In short, low speeds, this is not his thing. But after 5000 rev / min, the single-cylinder 4-stroke 4-valve begins to wake up gradually with more force at 6 000 r / min, 7000 r / min and 8000 r / min. In this range, the RC 125 is in its element. This is where we must seek the 6-speed transmission, also very sweet to handle, so you do not end up in sub-schemes under penalty miss its tracks. In this exercise, we appreciate the shiftlight that tells you the red zone at 9,500 rev / min and switch to 10,500 rev / min. KTM thus claiming clearly sports use, especially as its chassis lends itself quite well on Austrian roads. Not only RC reveals a very efficient road holding, but the suspensions set rather flexible offer both accurate steering and ride comfort not unpleasant. Qualities that will be confirmed later on the test track where, even in the wet, most athletes will go "ask the knee."